Support your active lifestyle with 20mg Hemp Extract Capsules. Capsule format is great for those that don’t want to bother with dosing from a tincture, or just want slower absorption into the blood stream. Our capsules are both vegan and gluten free. 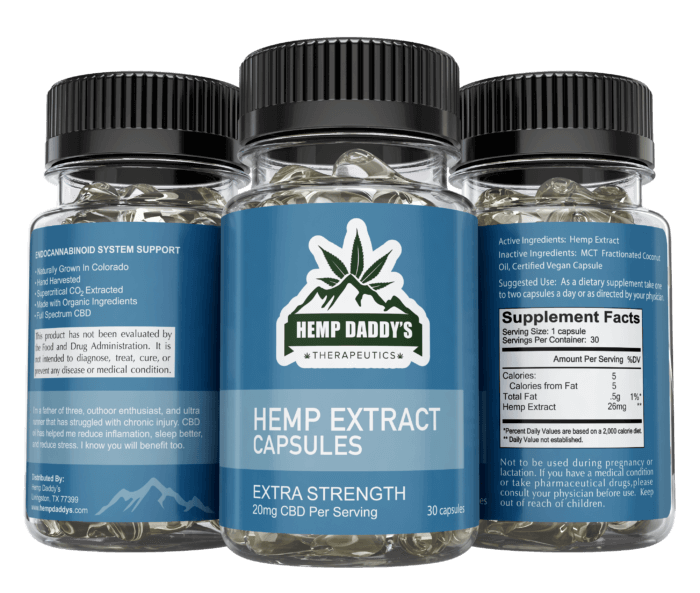 Hemp Daddy’s Hemp Extract Capsules are a nutritional supplement extracted from organic, Colorado-grown hemp. Take one to two capsules of hemp extract capsules daily to enjoy a happier, healthier life and enjoy many benefits. Our clean, premium hemp is grown organically in Colorado. The hemp is cultivated and nurtured on a family farm. It is hand harvested before being transferred to a local lab where the CBD is extracted using supercritical CO2 extraction. Pretty new into CBD. Tried one other brand prior to this, and can definitely tell the difference. Hemp Daddy’s does give me better results. Run and train for ultra distance events and can say that it’s been beneficial for recovery and inflammation. I have struggles with a really tight lower back (I’m admittedly lazy about stretching) and the CBD has been extremely helpful. 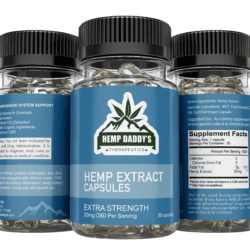 Also, the capsules just smell like real hemp and that just makes it seem better in my head….. whatever works. I love these gel caps. I feel taking them mid morning helps me the best! Works great so far! Definitely relaxes you a little bit and helps you to sleep better. Great customer service and fast shipping. 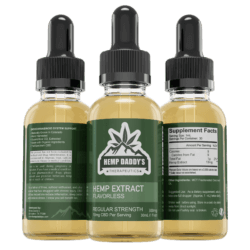 This was a higher dose than my previous tincture, and I’m certainly seeing benefits from them, in anxiety reduction, better sleep, and faster recovery times from workouts. This product is a triple threat for me. Easy to take, I’m not sure I’m feeling any effect yet but I’m sticking with it for 90 days to see what/ how I feel. Good call. Definitely stick with it. Try adjusting time of day you take your dosage as well, and increase dosage if you aren’t feeling the desired effects. Love the gel capsules of that slow release over time. Ironman Athlete, better recovery and better sleep! Super satisfied with my first shipment. Glad I bought my CBD from this company! It works but it appears I would need several weeks of treatment to see major changes ? Yes, you are correct CBD is best taken daily, not as a one time “solution.” It builds up in your system over time, and becomes most effective after about a month of use. My back pain is almost entirely gone with 20 mg a day! Love it!